Louis Aragon (French: [lwi aʁaɡɔ̃], 3 October 1897 – 24 December 1982) was a French poet, who was one of the leading voices of the surrealist movement in France, who co-founded with André Breton and Philippe Soupault the surrealist review Littérature. He was also a novelist and editor, a long-time member of the Communist Party and a member of the Académie Goncourt. Louis Aragon was born in Paris. He was raised by his mother and maternal grandmother, believing them to be his sister and foster mother, respectively. His biological father, Louis Andrieux, a former senator for Forcalquier, was married and thirty years older than Aragon's mother, whom he seduced when she was seventeen. Aragon's mother passed Andrieux off to her son as his godfather. Aragon was only told the truth at the age of 19, as he was leaving to serve in the First World War, from which neither he nor his parents believed he would return. Andrieux's refusal or inability to recognize his son would influence Aragon's poetry later on. Having been involved in Dadaism from 1919 to 1924, he became a founding member of Surrealism in 1924, with André Breton and Philippe Soupault under the pen-name "Aragon". In the 1920s, Aragon became a fellow traveller of the French Communist Party (PCF) along with several other surrealists, and joined the Party in January 1927. In 1933 he began to write for the party's newspaper, L'Humanité, in the "news in brief" section. He would remain a member for the rest of his life, writing several political poems including one to Maurice Thorez, the general secretary of the PCF. During the World Congress of Writers for the Defence of Culture (1935), Aragon opposed his former friend André Breton, who wanted to use the opportunity as a tribune to defend the writer Victor Serge, associated with Leon Trotsky's Left Opposition. Nevertheless, Aragon was also critical of the USSR, particularly after the 20th Congress of the Communist Party of the Soviet Union (1956) during which Joseph Stalin's personality cult was denounced by Nikita Khrushchev. Gardner, who calls the translation "pedestrian" and deems the rest of Aragon's writings on Carroll's nonsense poetry full of factual errors, says that there is no evidence that Aragon intended any of it as a joke. Apart from working as a journalist for L'Humanité, Louis Aragon also became, along with Paul Nizan, editor secretary of the journal Commune, published by the Association des Écrivains et Artistes Révolutionnaires (Association of Revolutionary Writers and Artists), which aimed at gathering intellectuals and artists in a common front against fascism. Aragon became a member of the directing committee of the Commune journal in January 1937, along with André Gide, Romain Rolland and Paul Vaillant-Couturier. The journal then took the name of "French literary review for the defence of culture" (« revue littéraire française pour la défense de la culture »). With Gide's withdrawal in August 1937, Vaillant-Couturier's death in autumn 1937 and Romain Rolland's old age, Aragon became its effective director. In December 1938, he called as chief editor the young writer Jacques Decour. The Commune journal was strongly involved in the mobilization of French intellectuals in favor of the Spanish Republic. In March 1937, Aragon was called on by the PCF to head the new evening daily, Ce soir, which he was charged with launching, along with the writer Jean-Richard Bloch. Ce soir attempted to compete with Paris-Soir. Outlawed in August 1939, Ce soir was re-opened after the Liberation, and Aragon again became its lead, first with Bloch then alone after Bloch's death in 1947. The newspaper, which counted Emile Danoën among its collaborators, closed in March 1953. In 1939 he married Russian-born author Elsa Triolet, the sister of Lilya Brik, a mistress and then partner of Russian poet Vladimir Mayakovsky. He had met her in 1928, and she became his muse starting in the 1940s. Aragon and Triolet collaborated in the left-wing French media before and during World War II, going underground for most of the German occupation. Aragon was mobilized in 1939, and awarded the Croix de guerre (War Cross) and the military medal for acts of bravery. After the May 1940 defeat, he took refuge in the Southern Zone. He was one of several poets, along with René Char, Francis Ponge, Robert Desnos, Paul Éluard, Jean Prévost, Jean-Pierre Rosnay, etc., to join the Resistance, both through literary activities and as an actual organiser of Resistance acts. Otto Abetz was the German governor, and produced a series of "black lists" of authors forbidden to be read, circulated or sold in Nazi Occupied France. These included anything written by a Jew, a communist, an Anglo-Saxon or anyone else who was anti-Germanic or anti-fascist. Aragon and André Malraux were both on these "Otto Lists" of forbidden authors. During the war, Aragon wrote for the underground press Les Éditions de Minuit and was a member of the National Front Resistance movement. His poetry was published along texts by Vercors (Jean Bruller), Pierre Seghers or Paul Eluard in Switzerland in 1943 after being smuggled out of occupied France by his friend and publisher François Lachenal. He participated with his wife in the setting-up of the National Front of Writers in the Southern Zone. This activism led him to break his friendly relationship with Pierre Drieu La Rochelle, who had chosen Collaborationism. Along with Paul Éluard, Pierre Seghers and René Char, Aragon would maintain the memory of the Resistance in his post-war poems. He thus wrote, in 1954, Strophes pour se souvenir in commemoration of the role of foreigners in the Resistance, which celebrated the Francs-Tireurs et Partisans de la Main d'Oeuvre Immigrée (FTP-MOI). The theme of the poem was the Red Poster affair, mainly the last letter that Missak Manouchian, an Armenian-French poet and Resistant, wrote to his wife Mélinée before his execution on 21 February 1944. This poem was then set to music by Léo Ferré. At the Liberation, Aragon became one of the leading Communist intellectuals, assuming political responsibilities in the Comité national des écrivains (National Committee of Writers). He celebrated the role of the general secretary of the PCF, Maurice Thorez, and defended the Kominform's condemnation of the Titoist regime in Yugoslavia. Sponsored by Thorez, Aragon was elected, in 1950, to the central committee of the PCF. His post, however, did not protect him from all forms of criticism. Thus, when his journal, Les Lettres françaises, published a drawing by Pablo Picasso on the occasion of Stalin's death in March 1953, Aragon was forced to make excuses to his critics, who judged the drawing iconoclastic. Through the years, he had been kept informed of Stalinist repression by his Russian-born wife, and so his political line evolved. In the days following the disappearance of Ce soir, in March 1953, Aragon became the director of L'Humanité 's literary supplement, Les Lettres françaises. Assisted by its chief editor, Pierre Daix, Aragon started in the 1960s a struggle against Stalinism and its consequences in Eastern Europe. He published the writings of dissidents such as Aleksandr Solzhenitsyn or Milan Kundera. The monetary loss caused by Les Lettres françaises led to its ceasing publication in 1972. It was later re-founded. In 1956, Aragon supported the Budapest insurrection, provoking the dissolution of the Comité national des écrivains, which Vercors quit. The same year, he was nevertheless granted the Lenin Peace Prize. He now harshly condemned Soviet totalitarianism, opened his magazines to dissidents, and condemned show trials against intellectuals (in particular the 1966 Sinyavsky-Daniel trial). He strongly supported the student movement of May '68, although the PCF was skeptical about it. The crushing of the Prague Spring in 1968 led him to a critical preface published in a translation of one of Milan Kundera's books (La Plaisanterie). Despite his criticisms, Aragon remained an official member of the PCF's central committee until his death. 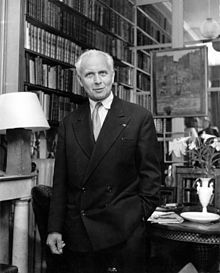 Beside his journalistic activities, Louis Aragon was also CEO of the Editeurs français réunis (EFR) publishing house, heir of two publishing houses founded by the Resistance, La Bibliothèque française and Hier et Aujourd'hui. He directed the EFR along with Madeleine Braun, and in the 1950s published French and Soviet writers commonly related to the "Socialist Realism" current. Among other works, the EFR published André Stil's Premier choc, which owed to the future Goncourt Academician the Stalin Prize in 1953. But they also published other writers, such as Julius Fučík, Vítězslav Nezval, Rafael Alberti, Yánnis Rítsos or Vladimir Mayakovsky. In the beginning of the 1960s, the EFR brought to public knowledge the works of non-Russian Sovietic writers, such as Tchinguiz Aïtmatov, or Russian writers belong to the Khrushchev Thaw, such as Galina Nicolaëva, Yevgeny Yevtushenko's Babi Iar in 1967, etc. The EFR also published the first novel of Christa Wolf in 1964, and launched the poetic collection Petite sirène, which collected works by Pablo Neruda, Eugène Guillevic, Nicolas Guillen, but also less known poets such as Dominique Grandmont, Alain Lance or Jean Ristat. Free from both his marital and editorial responsibilities (having ended publication of Les Lettres Françaises — L'Humanité's literary supplement — in 1972), Aragon was free to return to his surrealist roots. During the last ten years of his life, he published at least two further novels: Henri Matisse Roman and Les Adieux. Louis Aragon died on 24 December 1982, his friend Jean Ristat sitting up with him. He was buried in the parc of Moulin de Villeneuve, in his property of Saint-Arnoult-en-Yvelines, alongside his wife Elsa Triolet. He was and still is a popular poet in France because many of his poems have been set to music and sung by various singers : Lino Léonardi, Hélène Martin, Léo Ferré (the first one to dedicate an entire LP to Aragon, with his 1961 breakthrough Les Chansons d'Aragon album), Jean Ferrat, Georges Brassens, Alain Barrière, Isabelle Aubret, Nicole Rieu, Monique Morelli, Marc Ogeret, et al. Many of his poems put into music by Jean Ferrat have been translated into German by Didier Caesar (alias Dieter Kaiser) and are sung by his Duo. Aragon's poetry is diverse and varied. He favoured equally poetic prose and fixed-form verse, to which he brought a renewed sensibility. After a very free early period, marked by surrealism and its subversive language, Aragon returned to more classical forms (measured verse; rhyme, even). He felt that this was more in keeping with the national emergency during World War II. After the war, the political side of his poetry gave way more and more to lyricism for its own sake. He never went back on that embrace of classicism. He did however integrate a certain formal freedom with it, sometimes recalling the surrealism of his early days. Countless poems by Aragon have been set to music and become popular as songs. As a novelist he encompasses the whole ethos of the twentieth century: surrealist novel, socialist realism, realism, nouveau roman. Indeed, he was one of the founding personalities of the novel of his time. He was nominated for a Nobel Prize in Literature four times between 1959 and 1965. In 2010, La Poste (French Post Office) issued three stamps honoring Louis Aragon. ^ Martin Travers (2001). European Literature from Romanticism to Postmodernism: A Reader in Aesthetic Practice. A&C Black. pp. 176–. ISBN 978-0-8264-4748-7. ^ Arana, R. Victoria (2008-01-01). The Facts on File Companion to World Poetry: 1900 to the Present. Infobase Publishing. p. 71. ISBN 9781438108377. ^ Moorehead, Caroline. 2011. A Train in Winter. Pages 21-22. ^ Livres hebdo (in French). Éditions professionelles du livre. 1995. ISBN 9782877302500. Benjamin Ivry (1996). Francis Poulenc, 20th-Century Composers series. Phaidon Press Limited. ISBN 0-7148-3503-X. Wikimedia Commons has media related to Louis Aragon.